This invaluable resource will help both full and part-time postgraduate students from all subjects to do research better, quicker and with as little hassle as possible. `A good introductory text for prospective PhD students and a useful resource for research trainers who wish to provide an initial overview to a varied audience' - The Research Training Initiative at Birmingham Insitute of Art and Design This invaluable resource will help both full and part-time postgraduate students from all subjects to do research better, quicker and with as little hassle as possible. Doing Postgraduate Research is pioneering a new generation of research training materials. It recognises the greater importance formal research training now occupies in research degrees. This practical text will enable the student to develop their abilities to draw upon a range of research training materials and to select those that are best suited to their own research training needs. The book concentrates on tasks that all postgraduate research projects face and include: - designing and organising a research project - doing a topic review - writing skills - using computers - considering rights and ethics in research the process of the thesis examination and (where held) the oral examination The book encourages student `training by doing' , and is designed to be used by students while they are doing their own research work. The text includes numerous activities for students to apply what they are learning to their own projects. 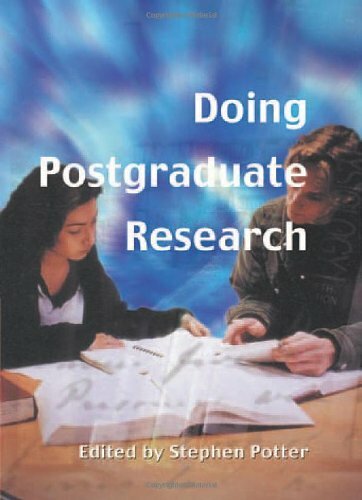 Doing Postgraduate Research has been developed from an Open University training pack for research students, and is compliant with UK Research Council training requirements. It will be invaluable to all students, supervisors and all with research training responsibilities.